Third venture into game changing technology. Polymer stocks. 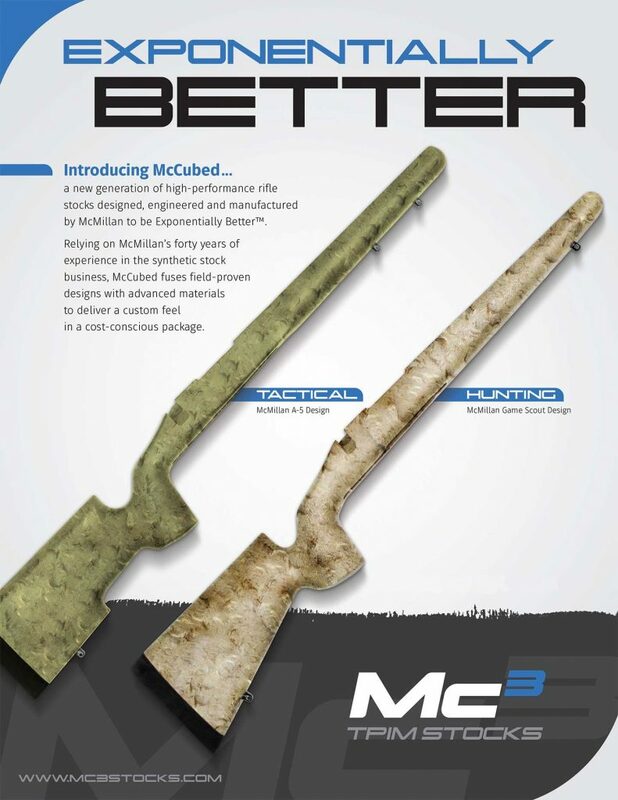 Some of you may have already heard about McCubed, a new division of McMillan dedicated to designing and developing the finest polymer stock on the market today. It probably shouldn’t be new since I told my father back in 1992 that I believed that McMillan should be in the plastic stock business. His reply was “Cadillac doesn’t make an economy car, McMillan doesn’t make a cheap stock.” And I agreed with him to a certain extent. Even back then the McMillan reputation was built on the finest synthetic stock money could buy, supported by the best customer service in the industry. But, it wasn’t too long after that conversation that Cadillac, Mercedes Benz and BMW all came out with an “entry level” luxury car. Now, it is common place for any of the high end luxury car makers to offer an option or two in the price range that reaches a larger portion of the existing market. About a year ago I came to the conclusion that the time for stretching the boundaries of our market is now. For as long as anyone can remember McMillan has been the most expensive stock on the market. And just to be clear, it isn’t because we are greedy. In truth we probably have the smallest margins of any one in this business. A McMillan Fiberglass stock is made using the most expensive and time consuming methods used in the synthetic stock industry today. It requires 8.5 man hours to produce every McMillan stock. I have 65 employees working in a 15,000 sq. ft. facility. That means that I have allocated 230 sq. ft. per employee. Take out the six restrooms, two lunch rooms and numerous closets, we are probably much closer to 150 sq. ft. per employee. My office is 10’ by 16’ so I am actually about right at the norm. But the process, and the fact that a large percentage of my employees have worked for me between 15 and 30 years, allows us to make the very best quality fiberglass stock available. So why would I consider making a plastic/‘Tupperware’ stock? There are many of them on the market that range in price from $99 to $279. What am I doing risking the McMillan reputation on a plastic stock that may or may not be profitable? How did I come to the conclusion that this was a good idea and that it would be good for McMillan? These were the questions I had to ask myself before I was willing to make a commitment to a very expensive project. Having plastic injection molds made is very expensive. I will end up with more money invested in the first couple of molds than I have in 7 Haas CNC milling machines which run 8 hours a day at least 5 days a week inletting McMillan fiberglass stocks. What was it that made me think this was a good idea? So what follows is my thinking on the above proposed questions. Also, you will get a look inside the man (me), to see what makes him tick so to speak. And before you are finished reading, you will have all the answers to these questions, so hold on tight, you get to be an entrepreneur for the next few minutes. McMillan stocks are expensive. They start at 536.00 and go up from there. That is completely finished and ready to bolt onto your barreled action. Now I think we get a bad rap. No one ever complains about how expensive a custom barrel is. Even though the price of a match grade stainless steel blank is around $350 plus the cost of fit and chamber, and will absolutely wear out with a certain number of rounds through it, no one complains. Never mind that every McMillan stock has an unconditional lifetime guarantee, and that you will never have to buy a stock to replace it as long as you live; people just don’t understand the value they get. Having said that, I get it that a McMillan stock is not cheap. There are people who would love to have a McMillan that just can’t ,or won’t, let go of $800 to get that new A5 McMillan. And unfortunately they may never buy a McMillan. But what if? What if there was a stock that was available that cost $275.00? What if it was made to fit either a Remington L700 or S700 with a varmint barrel contour that would fit your Sendaro or your Varmint Special? Would anyone buy it? Man I don’t know, there is a lot of bad stuff on the net about ‘Tupperware’ stocks. No one has a very high opinion of a plastic stock. They are too heavy, too flimsy, too ugly and poorly made. They are less stable in both high and low temperatures. That is what people are saying. They aren’t worth the effort to throw them away. If you buy a factory rifle with a plastic stock, replace that thing asap! So here is the plan. We give them a stock that no one else can offer. How? We start by using the McMillan A5 pattern which is the best-selling most copied and most sought after stock design on the planet. Surely if a guy had a stock that was designed just like an A5 he would consider it. But in order to mold the A5, we have to develop and use a process that no one else has ever used. There is a reason why no one else has ever done anything in plastic that even resembles an A5. The geometry won’t allow you to mold it using conventional processes. So let’s say I develop this process and can now offer a pattern no one else in the industry can offer. Does that help? That’s a good start, but just offering the best design doesn’t overcome all the negatives associated with ‘Tupperware’ stocks. What if this new process not only allows me to offer an A5 pattern, but also allows me to specifically control wall thicknesses which in turn allows me to controlled strength and weight. Being able to engineer superior strength in a specific weight will help combat the notion that polymer stocks are too heavy and too flimsy. What if I used a proprietary custom formulated polymer that no one else in the industry is using. What if I work with the best polymer engineers in the business to come up with a material that not only has better performance in both high and low temperatures, but has far less moisture absorption as well as chemical resistance that any material being used to make stocks currently? Would that help to convert some of the nay-sayers on the web? I believe it will. The McCubed stock will look different that any stock on the market. It will be a known pattern that will immediately be associated with McMillan. The vast majority of people who see 10 products on a table, with one clearly standing out as different, will associate that difference as being better. People already associate McMillan products with being better. When we show them that the product is better, tell them why the product is better, and prove to them that the product is better, we can start to break down some of the barriers that exist in this market. Then we offer some things that make a stock more desirable, like molded in aluminum pillars, a flush cup sling swivel mount on the rear of the stock, two sling studs in the front that can be exchanged for a 4” McMillan Picatiny rail, and finally we offer them in finishes not ever seen on plastic stocks before. I think we’ve done it. We have chosen the right time in history to once again change the nature of things. From this time forward, the ‘Tupperware’ moniker will no long apply to all polymer stocks. There will be one that stands out from all the others. But what else would you expect from McMillan! I agree. Prime example of the need for such a stock is the Ruger American rifle. Several reports of the Ruger plastic stock flexing under firing and recoil forces. McMillan can do better than this with the MC3 stock. Get every bit of accuracy out of the American rifle in all weather conditions. Anyone that knows McMillan knows they take a tremendous amount of pride in their brand, I mean it has their name on it. And when a company decides to do anything like this you better believe they’ve invested a ton of time and energy to make sure it’s spot on. McMillan is an established company that doesn’t need to have a entry level price point stock. But they want to because they see the need to help shooters get out of garbage products. That blog post was awesome! Thanks to Kelly and team for being transparent and speaking truth about Tupperware stocks.